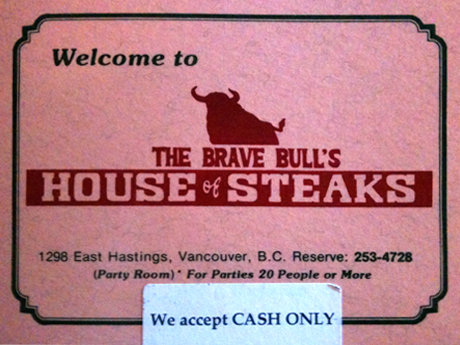 I’ve driven by the Brave Bull’s House of Steaks on the corner of Hastings & Clark in Vancouver hundreds of times for a couple decades, but I’ve never ventured inside. Why would I? It looks like it’s about to fall over, is in a sketchy part of town (that’s being polite) and advertises Prime Rib and Top Sirloin for $9.95—and that includes soup and salad! This is not your dad’s Keg Steakhouse folks. Recently my friend Ryan and I mustered the nerve to meet at “The Bull” for dinner. And you know what? It was good! I know! It wasn’t fancy like a visit to Ruth’s Chris or Gotham, but we enjoyed the old school steak served with baked potato or fries plus salad or veggies. 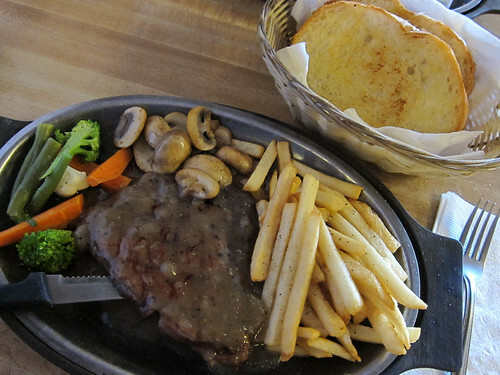 Pepper steak, served with sautéd mushrooms and veggies, plus fresh cut fries and garlic toast—oh, and soup to start. Not bad for twelve bucks. The signs outside the decrepit looking building, with their loud and proud offer of “Prime rib dinner for only $8.95!” have always made it seem like a place for penny-pinchers, not those interested in a good cut of meat. And really, is a good deal on beef really such a good deal later on when you pay the price? Nuff said. Once inside however, one of the first things I noticed is that they serve only Alberta Grade A beef. Hmm. 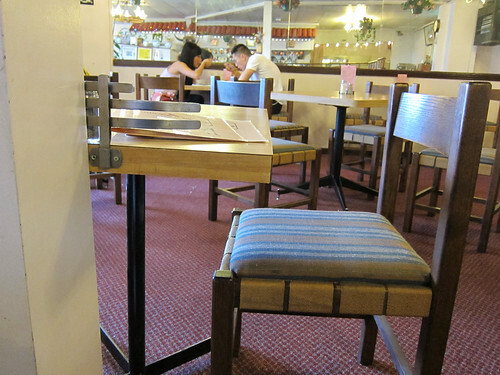 The only person in the clean but unadorned dining room was an old Chinese woman named Linda. When asked about the restaurant, she rambled on for minutes in her thick Cantonese accent about how she and the cook had been there for over 25 years, and how before that the line cook had been grilling up steaks at Black Angus for 17 years. With an additional 6 years before that even, this adds up to 48 years in the kitchen over a hot grill. That would explain why when I asked for my pepper steak to be medium rare, it was indeed medium rare. Exactly right in fact. 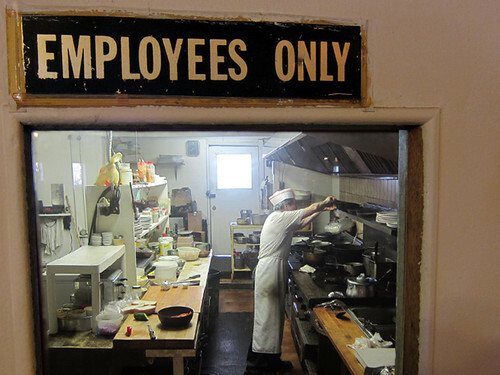 The old cook has been on the grill, making steak "the right way" for 48 years. Folks like Chowhound have called this place “a strange relic,” going so far as to describe the clientele as “an odd mix of truckers, tattooed longshoremen, prostitutes, and slumming hipsters.” Now that may be so, but I don’t it’s fair to write this place off entirely. Perhaps I like “sketch” more than most (I think I do), but I enjoyed its kitschy diner-style ambiance appealing compared to the generic Keg vibe we’ve come to expect from typical steakhouses. You could shoot an entire movie using this restaurant as a backdrop. Sure, the ingredients weren’t über high-end, and the preparation wouldn’t win any awards, but I quite enjoyed the humanity of Brave Bull’s House of Steaks. It was comfortable, we were treated well, and our reasonably priced steak dinners ($32 total for two!) were delicious. And that’s no bull. The dining room is more like a diner than a steak restaurant, but it has tons of old school charm. These two Chinese young people were there on a date. For some photos of our trip, check out my Brave Bull set on Flickr. Oh, one last thing. They only accept cash apparently. PS – One bit of interesting trivia about the Brave Bull is that the logo was designed by famous Canadian design icon Jim Rimmer, apparently in exchange for a case of chicken burgers! Awesome. Every Vancouverite who likes steak should try this place just once. Linda is a charming lady and the steak is solid stuff there. The atmosphere is funny in an ironic way too. Hee hee. Don Taylor on Sportsnet just suggested the best choice for a corporate sponsor name for BC Place would be The Brave Bulls House of Steaks Place. **NEWS FLASH** Brave Bull’s House of Steak is closing its doors forever. Linda and Frank are finally RETIRING AFTER 27 YEARS!! Last day for business is Sunday, September 2, 2012. SELLING RESTAURANT EQUIPMENT , SUPPLIES, tables, chairs, decorations, utensils, glasses, cups, plates, freezers, AND MORE on LABOUR DAY. Come and check it out. VISIT THEM ON LABOUR DAY, SUNDAY, SEPT 3RD – 12:00 NOON – 5:00 PM and TAKE HOME A PIECE OF BRAVE BULL MEMORABILIA !! CASH & CARRY ONLY. WISH Frank & Linda luck in their GOLDEN YEARS!! They would LOVE TO SEE YOU, TOO.